a faithful representation of modern F1 racing. Diehard fans will likely praise it for its depth while railing about missteps. Although coded primarily for the gamepad crowd, this multiplatform sequel offers wheel-and-pedal equipped sim racers a persuasive reason to take a break from their online iRacing contests. Codie's EGO 3.0 gaming engine can't match top line simulations for outright driving fidelity, but it fakes the process well enough to give those pricey force-feedback wheels an enjoyable workout... especially with cheats like ABS and traction control switched off. Enable the game's brilliant dynamic weather, and trackflooding rain showers add further drama to an already challenging search for road-purchase. Featuring all 11 teams, 22 drivers, and 19 tracks from the 2013 F1 season, the game's exclusive F1 licensing remains a key selling point. Codemasters expertly replicate each vehicle right down to the wheel nuts, and whether I opted for Lewis Hamilton's Petronas Mercedes or Fernando Alonso's UPS-liveried Ferrari, I was racing the best-looking Grand Prix cars my PC's ever seen. The circuits are similarly well done, boasting levels of detail that will impress even the most demanding F1-ophile while remaining surprisingly playable on mid-range PCs (I was easily able to max out all graphic settings on my dual-core, 4GB RAM, Radeon HD 5850 PC). 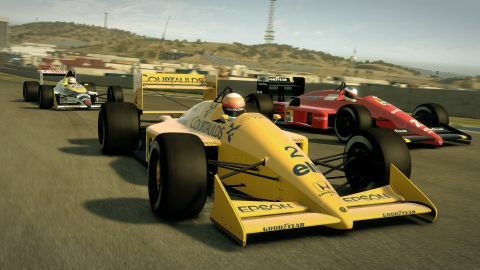 F1 2013's splashiest new feature is the addition of classic Grand Prix cars from decades past. Flinging Alan Jones' FW07B Williams through Brands Hatch's sphinctertightening Paddock Hill Bend, or smoking the tires of Gerhard Berger's turbocharged Ferrari F1/87 out of the final hairpin at Circuito de Jerez, was both exhilarating and tempering as I came to appreciate the limits, nuances and personalities of each car. The basic game offers five of these beasts plus two 1980s tracks, while the Classic Edition adds another five 1990-era cars and two more circuits (albeit for an additional £10). The limited car count sets up some sad looking ten-car grids – a 1980 Williams has no business racing a turbo-era 1988 Lotus – but the nostalgia is still compelling. Multiple play modes include an expanded Young Drivers Test and carry-over Career, Time Trial, Time Attack, and Season Challenge options. Codemasters have also reprised the much missed full season Grand Prix mode and exchanged F1 2012's Champions mode for an entertaining new Scenario alternative with gamer-centric challenges. Solo players will also appreciate the savvier AI, less draconian penalty system, and overdue inclusion of mid-race game saves. Apart from some warping issues in graphically intense wet races, the RaceNet-enhanced online multiplayer game is largely hiccup free, hopefully attracting more players than F1 2012's woefully under-populated effort. F1 2013 does have speed bumps: most notably its pathetically short, non-saveable replays, mouse-less console interface, and overpriced classic '90s car collection, but these are poor design decisions, not bugs. There's enough simulation here to keep F1 fans of all stripes burning those Pirelli slicks down to the cords, and enough game to etch a smile on their face while doing so.